Bath Waste With Brass Plug & Ball Chain - Only £7.99! In stock now for only £7.99 including VAT! Hurry while stocks last! This great value, high quality chrome coated standard bath waste is constructed in the very finest brass and manufactured to the very highest standards. The superior quality of this item is reflected in the outstanding 10 year guarantee provided as standard. This superb waste is an essential addition for the installation of any bath. This waste features a ball chain. This Standard Waste With Brass Plug And Ball Chain is the ideal addition to any standard bath. This superb bath waste kit is made of brass and coated in chrome. It is ideal for all standard baths up to 5mm thick, including the majority of the baths for sale on this website. 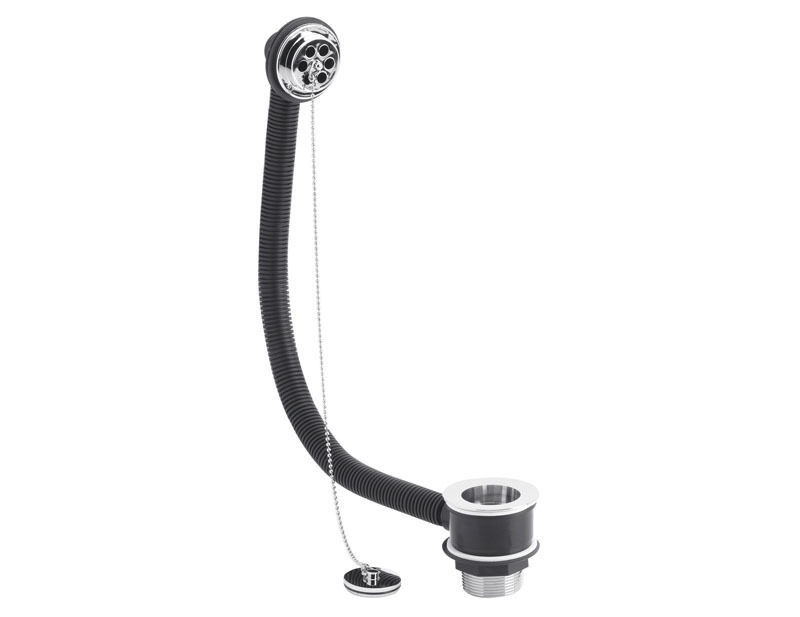 It is supplied complete with a chrome plated chain, a metal plug and overflow section. Known for its superb versatility and ease of installation, this is one of the most popular wastes we sell. It is available at a highly competitive price, offering a highly attractive combination of value and quality.